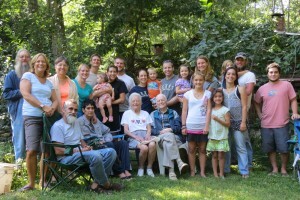 John Drescher with the family that he loved, August 2013. Photo provided. That’s one of the many quotes we received over these last two weeks from your hearts to ours. We’ve been overwhelmed and grateful for your love to us and for our parents. Many of you know that two of Dad’s greatest joys were writing and preaching. The man we knew best was the one who cried tears of overwhelming grief and unspeakable love and who surrounded us with his laughter, his creativity ,and his daily prayers for each of us by name. When he couldn’t stand long enough to preach any more this past year and his hands were too shaky to write—when all that was over, the thing that kept him wanting to live was his family. He cried tears of unspeakable love as he told us that even though he was so eager to touch Jesus, he cried tears of overwhelming grief to know that he was leaving us. Dad worked out his life with words, writing them and sharing them. He worked at how to do relationships with words. He admitted that our mother was the one in his life who inspired him to write about the fruit of the Spirit. He asked her out for a date when someone in college pointed to her and said, “That woman would do anything for anyone,” and he found out how true that would be. Dad moved around a lot when he was a child and made a decision to not do that when he had a family. He did travel a lot for the work that he loved. When he came back, he always had something in his suitcase for each of us—usually a pack of life-savers—that was a splurge for him, to let us know he’d missed us. 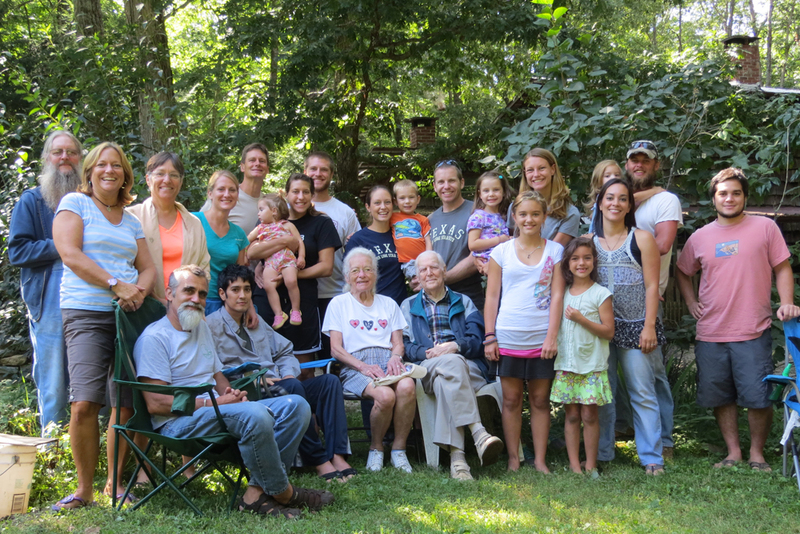 In the summers, he plowed up a plot for each of us in our big garden and taught us the value of honoring the land. I remember him bragging to anyone who would listen about the big cantaloupe I raised and sold at our roadside stand, to earn money for Christmas presents. He was my overt cheerleader in everything from my childhood creations to being a pastor when it wasn’t okay for women to do that. His favorite sermon to preach—the one he told me a few months ago that he still wanted to preach again—was on encouragement. He was a cheerleader for the church of Jesus Christ, for each person who shared their stories with him and for each of us in his family. Dad taught us by his example to never accept a job based on what it will pay, but how it resonates with God’s calling. He taught us to decide how much we need to live on and give the rest away; that giving away 10 percent of what we earn is only the place to start. He showed us that miracles happen all around us, all the time, and that we just need to notice them. Before gas got expensive, he took us on Sunday aft drives to look at the “views.” It was always the same one, but it was always newly amazing to him. Nature was to be honored and enjoyed. Life itself was a miracle. Each of us in the family have our own experiences of times that he and mother together prayed us through crises of health and faith and emotional upheaval in our lives. I’m sure our memories of his faith and the power of prayer will help us keep watching for and expecting miracles, but we’ll miss his prayers. May it be so for each of us, as we choose to allow Dad’s prayers and his spirit to live on through us. John M. Drescher passed away on July 10, 2014. Excerpted from the eulogy given at John’s funeral by his daughter, Sandy. Posted with permission.